Linköping University is now taking the next step on the way to its new external website, and opening the beta version to the public at beta.liu.se. Overhauling the LiU website and placing it onto a modern platform is a huge and complicated task. Key guidelines in the work are that the site is to be oriented to external visitors, it should be easy to navigate through the site, and visitors are to find relevant and correct content that is also inspiring. Since February, everyone at LiU has been able to follow how work with the new site has progressed. The webpages are now being made available also to external visitors. Construction of the new liu.se involves a great deal of work. At the same time as the technical development has been going on, a group of web editors has been working hard to fill the website with content. Since both the graphic design and the way in which information is presented are new, the content must be built up from scratch. The search engine has been improved, and the pages that present LiU employees have been given a new, more attractive appearance. The systems developers at LiU are also working intensely to complete the technical platform (the web-publishing system) and all the connections to other systems that will provide content to the new liu.se. One such connection that will be of major significance is integration with the educational database used by all of the faculties, Bilda. The launch schedule. Now that beta.liu.se has been made public, preparations for the official launch of the new external website, liu.se, continue. Extensive work during September and October will ensure that the new web-publishing system Sitecore is working effectively. During November and December, work will focus mainly on quality assurance of the content. The content will be fully reviewed and prepared for the switch from beta. Making the beta public is one way to publish the webpages and observe visitors’ reactions. Furthermore, now that the beta is public, it is possible to link to information that is being placed into the new structure. The new external liu.se has been designed with a focus on external visitors. The main content is – as it is on the current website – recruitment information for the programmes offered by the university, and information about research here. The research information is in turn divided into two categories: broad presentations for non-specialists and more detailed descriptions of research projects (research activities). Two important guiding principles for the new site have been that it is easy to find correct information, and that it is reliable. A further principle has been that the pathway to the correct contact for further information is short, and the presentations of the employees is a central element of this. 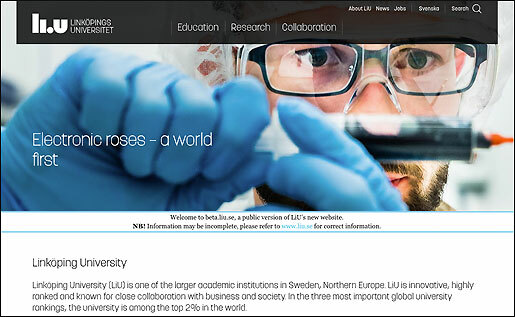 “Remember that the new liu.se is primarily intended for external visitors, and we have created opportunities for researchers and research projects to present themselves and their activities to different target groups. A clearer and simpler structure for how we present our programmes is also an important element in the competition for new students,” explains Mariethe Larsson. An analysis of the current site in preparation for the new website showed clearly that an extremely large part of the traffic at liu.se is internal. This is something that the new external website is attempting to remedy. This means that a great deal of internal information will not be presented on the external website. So the next step will be to manage the internal information and communication. A relatively short time, approximately six months, after the official launch of the new website, the old one will start to be gradually dismantled. This will take place initially by placing it behind some form of wall for external visitors, allowing it to continue to act as an intranet. Completely removing the old website will, of course, depend on a solution being found for how to handle internal material.